Do You Constantly Criticize and Belittle Yourself? How Badly You Treat Yourself? You can change this – BUT I CAN GUARANTEE THAT IT WILL NOT CHANGE ALL ON ITS OWN! The bottom line is …. you will need to take some effective action! The Solution Does Not Have to Be Difficult or Expensive! In this powerful and proven system, you will receive simple, easy-to-follow lessons and in-depth exercises that show you exactly how to successfully find your Inner Friend and silence your Inner Bully. Create a positive relationship with your Inner Friend. 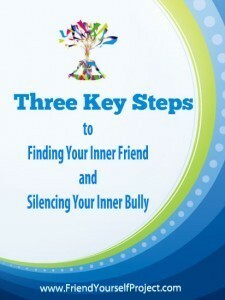 Escape the negative influences of your Inner Bully. Become your own strongest cheerleader and supporter. Fill your mind with a more positive and optimistic attitude. Receive this 3 part system via emails sent to you every other day, allowing you the time and space to incorporate each lesson fully. Change Your Life By Changing How You Talk to Yourself!